There are two editions for this book, a hardcover edition published in 2004 and the paperback edition in 2007. With David and Charles (DC) being the publisher. The format of the paperback edition (2007) is horrible. The pages are clearly laid out for a landscape format book but the book is printed in portrait format. You have to rotate the book for every single page you want to read. It gets tiring immediately. For some of the paintings that span two pages, they are cut off at the bottom of the left and right pages. In usual landscape format, they would have been printed across the gutter. This is ridiculous. The content is great. 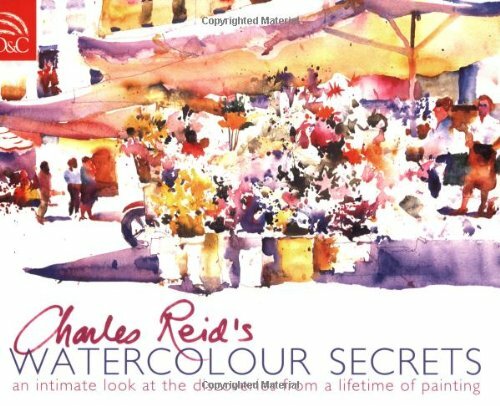 Charles Reid's style is loose and at times splashy, just like the one on the cover. There are useful tips and instructions on every page, some step by step tutorials and little exercises for you to experiment. Overall, because of the printing format, I won't recommend this book because it's just too frustrating to rotate the book every time. FYI: The original version of this book, published by NorthLight Books 2004, is in the landscape format, with content also in landscape format. It appears that D&C printers blew it. Thanks. I'll update my review to highlight that.